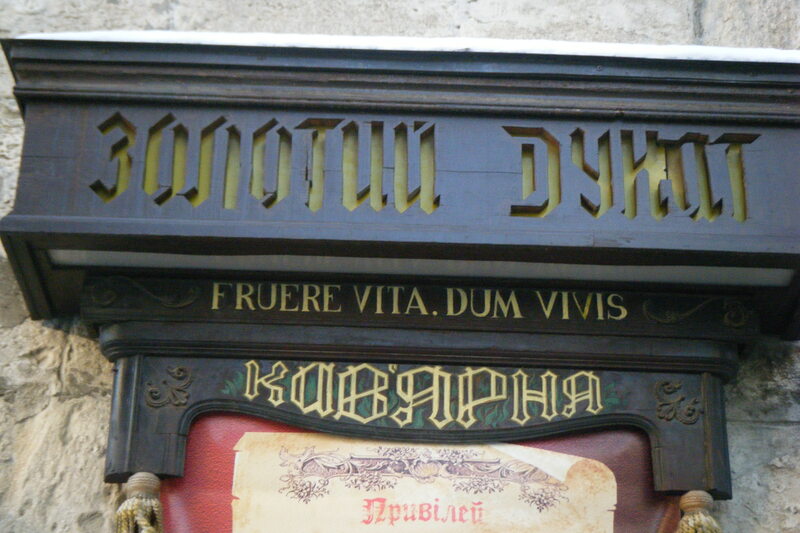 Lviv: The way Central Europe was. This is serious stuff. The doorman – if you could call him that –is dressed in full military garb, wielding a very real looking PPSh-41 sub machine gun and smoking a chunky cigar of 80’s action movie proportions. Slava Ukraini! (Glory to Ukraine) he barked at us. Luckily I was with 2 cute Ukrainian local girls who knew how to respond. Geroyam slav! (And to its heroes) they giggled. The man gave the slightest of nods. Rosiyu??!!! (Russian) he barked, pointing accusingly at each of us. The man then gave a wide eyed grin, opened an old, steel door and ushered us in to the bar. It was a dramatic start to my first night out in Lviv. But then this is a city which just keeps on surprising. At 5:30am that same morning – 10 hours after boarding the Kiev to Lviv overnight express – the lights flickered on and groggily awoke me and my 3rd class sleeper carriage comrades from what had been a surprisingly comfortable sleep. A crackly, gargled announcement then came on over the intercom in both Russian and Ukrainian, alien to me on all levels but for my strained effort to successfully make out the annunciation of the word Lviv (pronounced Liveev). The city known as Ukraine’s cultural capital was the only train stop in any case – and my destination for the next 2 days. Half an hour later the train lurched to a stop, I gathered my bag out from under my bunk stowaway and got off onto the dark and dimly lit platform at Lviv Central Station. At 6am the temperature was sitting comfortably in the region of -15 which compared with a few nights ago felt positively balmy. Not that anything less should be expected when travelling East of Eastern Europe in the middle of winter. While the cold, misty air was definitely refreshing, a shower and change of thermals was an imminent priority. Outside, cabbies were lined up everywhere in front on the station, all of whom were smoking heavily in front of beaten down Soviet era Volga taxis and had world-weary expressions beneath massive fur hats. After clumsily negotiating an exorbitant 45 hyrvinia fare (about NZ $7 – locals would pay a third of this) in appalling Russian, it was a 15 minute cab ride to my Hostel – the Kosmonaut – well located on the southern edge of Lviv’s old town. Right from the Volga spluttering into life and revving down the frozen road I could tell this was a city vastly different from Kiev. The Ukrainian capital along with most of the former Soviet Union was devastated during the war and subsequently rebuilt as imposing Stalinist Monoliths (Nothing against Kiev – I loved it). Lviv on the other hand was one of the very few that escaped such destruction and successfully retained its traditional central European style. This is a city of Patriots with little patience for Russian culture or comparisons. Even before I’d reached the Town centre I could see plenty of buildings that were an eclectic mix of Gothic, Romanesque, Baroque and Italian Renaissance – a world away from what I’d been expecting. After dropping my things off and getting refreshed it was time to see the old Town up close. Let me paint you a picture. Take the glorious tourist traps of Central Europe – Krakow, Budapest, Prague, Vienna, remove tourists, and go back 25 years in time. Now you’re in Lviv. But there are distinguishing features. The outstanding and beautiful architecture has just a slightly grittier, authentic feel to it. The cobbled roads serve host to droves of elsewhere-impossibly-elusive Soviet Volga and Moskvich avtomobil’ from the 60’s and 70’s.Even the prices are from another era I thought as I handed over the equivalent of 8 NZ cents for a cup of smouldering mulled wine. The best place to take it all in at once is from Lviv Castle hill. While the castle has been gone for centuries, the panoramic views at the top are outstanding and really show off the cities best bits –in particular its two glorious centrepieces – the beautiful Latin Cathedral and Town Hall. But getting in amongst it is what makes Lviv so much fun. It is wonderfully compact and everywhere you turn there’s another snugly hidden bar or cafe. Both of which this city does awesomely. Some even call it the Little Vienna. Going off a recommendation from Lonely Planet, I eventually found the slightly hidden underground coffee and hot chocolate joint known as Zolotyy Dukat which was so incredibly good – I almost lost all inclination to try out anywhere else. Asides from its surprisingly cosy cave like ambience, the massive menu (available in English) offers an elite, gourmet range of some of the most elaborately garnished coffee and hot chocolate creations anywhere, ever. For $NZ1 I asked for a hot chocolate that sounded good – and was presented with a piece of culinary art that tasted like heaven. Pretty soon I was ordering half a dozen more just to see what I was presented with. That night I went with two of the staff from our near empty Hostel to Kryjivka – the place from the opening anecdote. Once inside the girls took great delight in ordering a bottle of local horse radish Vodka and forcing most of it into me. Results were predictable. By the time food came along I was well sloshed. Turns out we were eating a 5 foot sausage with a jar of some sort of mustard on the side. The girls dared me to put some of it on my portion. Feeling like superman I obliged, lathered on a ridiculous amount and bit in to it. It tasted like Lava. I’ve never spat something out so fast in my life. My eyes then welled up so badly that my contact lenses slid out and I proceeded to gulp back 2 litres of water to get the taste out. This of course was accompanied by riotous, knee slapping laughter from the two girls and every other local within a 10 meter radius, though I barely noticed it at the time. None-the-less it was an incredibly fun night. So how long will this glorious secret be kept? The answer is not long. In 2012 Ukraine and Poland will co-host the European football Championship with one of the semi-finals scheduled for Lviv. It’s already been touted as a Prague-in-waiting and one can easily see why. Beautiful, affordable and well hidden European cities are becoming harder and harder to come by. My advice is to get there now.